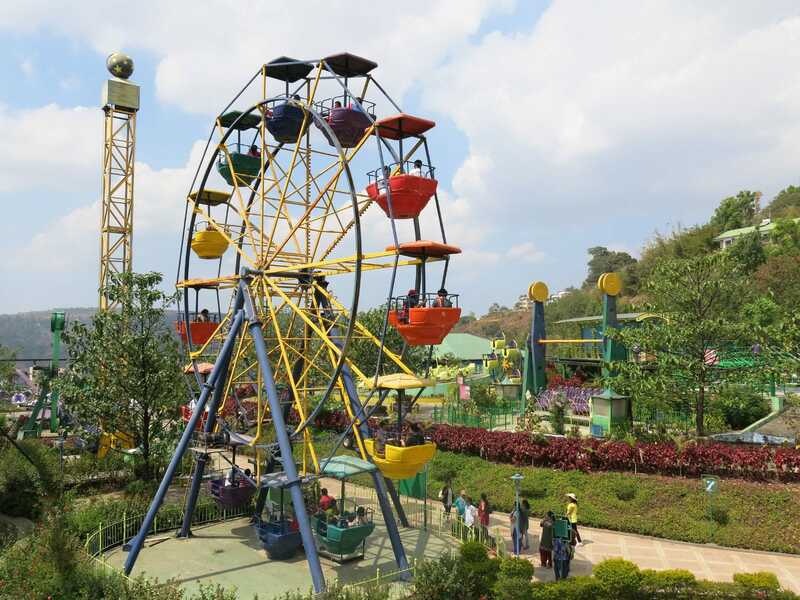 It took us just over two hours to cover the ninety kilometres to On Wheelz Amusement Park from our hotel on the outskirts of Pune. The last half hour of the drive involved a slow climb up the side of a mountain with cars overtaking on both sides, even on blind corners, a pertinent reminder of how car travel in India is not for the faint of heart. Nervous readers are advised to focus on the spectacular scenery, and leave the road to the driver. 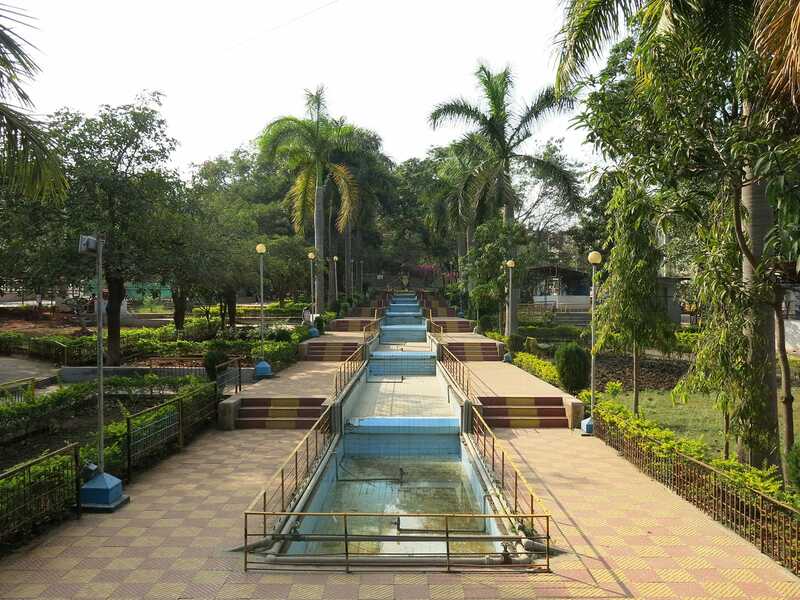 The entrance to the park is at the base of some colourful steps surrounded by neatly tended flowerbeds. Admission costs INR 100, and includes one go on the Ferries Wheel (sp) and the Breakdance, a local copy rather than a genuine Huss product. Additional rides cost just INR 50 per ticket. The layout of the park feels like a miniature version of Tibidabo, with four distinct levels and a spectacular view that does more for the overall experience than elaborate theming ever could. At first glance Zyclone (#2014) looks like it might be one of the small Pinfari designs, such as the Z40. However, it is missing the second descending helix common on these models, and looks a little odd as a result, with a large area of empty space under the turnaround after the first drop. Additionally, the loading platform is built almost a foot away from where the car stops, a definite indication that this ride is not a western product. Oddities aside, however, it tracks well enough that we decided to pay for a second go. The Ferries Wheel (sp) was a fast one making it close to impossible to photograph from. I'd probably have done better from the top of the Free Fall, which wasn't particularly aggressive, but I'd left my camera on the ground for safety. The best pictures are to be had from the Monorail, especially if one wants an overview of the coaster. 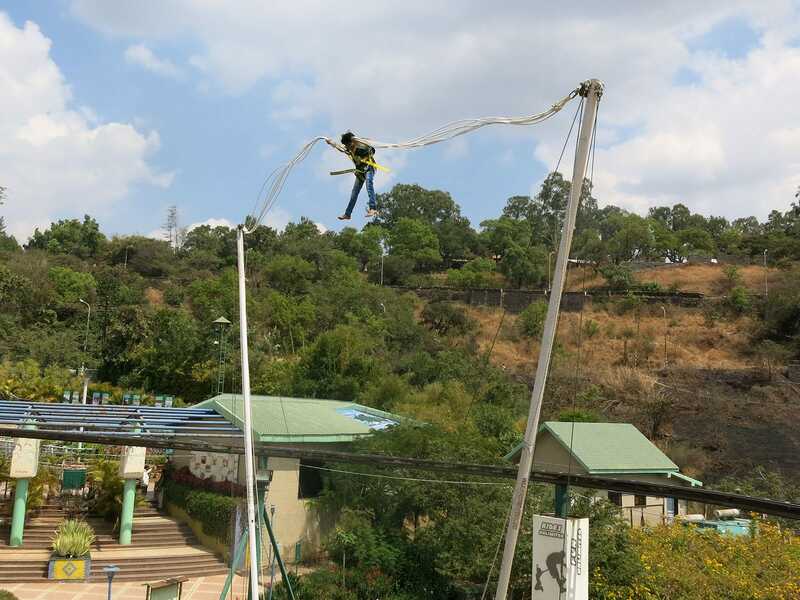 The park has an interesting take on the Reverse Bungee rides common in the rest of the world, in that passengers on this one are not given a seat; instead, their harness is attached directly to the release mechanism, and once the cords tighten they are flung about one hundred feet into the air like rag dolls. I'm probably about twenty years too old to try something like this without injury, but it was certainly fun to watch! The last attraction we tried was the Haunted House, a home-spun walkthrough located on the second level of a building above a small amusement arcade. We were escorted through by a member of staff, as some of the clearances were very narrow, and there were two steps in the middle that one could trip on if not careful. The scenes inside were about average for a park of this type, and it was well worth the time. Appu Ghar was added to this trip as a way to fill some time before an evening flight. We'd not been expecting a huge amount, but to our surprise we found a pleasant park with a good selection of rides. Most were geared at a younger audience, but there were a number of full size spin rides to entertain older visitors. The general appearance of the powered Roller Coster didn't inspire a lot of confidence, with a uncovered motor on the back and a front car that was in the process of falling apart, the track clearly visible through what remained of it. Despite that, it gave an aggressive and memorable ride, well up there with the fastest powered coasters. The lateral forces were strong enough to make me wonder whether the ride might fall apart while we were on it! With no other stops scheduled today, we elected to have a meal in the park restaurant. The menu was entirely vegetarian and several items on it were not in stock today, but after a bit of back and forth we managed to find something that worked for us. The quality was excellent, though those afraid of strong spices would have had trouble; the chef was more than a little heavy handed. We rode the Guided Car monorail for some aerial photographs. It was running quite fast, but was far enough away from the other rides that there was enough time to set up the shots we wanted. Very fast rides seemed to be the norm at the park; the Bhoot Bancala ghost train felt more like a powered coaster than a dark ride, with strong laterals on each corner. The scenery inside was excellent and deserving of far more time than I had to take it in.